It's Typo Tuesday! Are You Dressed for the Occasion? I didn’t ask Eleanor where she discovered this gem, but I don’t believe it was while shopping for Halloween décor. I would give the store a point for wit if so, but I’m not convinced that’s what they’re going for here. 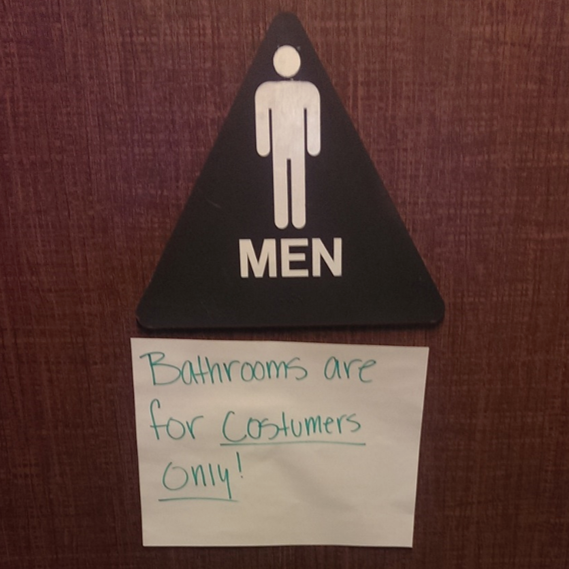 While costumers will likely appreciate a restroom break, where are all of the non-costumers supposed to go? You Have a Magic Portal at Your Fingertips! We live in an age of smartphones, real-time entertainment, and information at our fingertips, so why not take a moment to run words through a spellchecker? If you won your 3rd grade spelling bee and are 100% certain that you’re spelling everything correctly, then more power to you, but for the rest of us who are mere mortals, I have a secret to let you in on: That phone that’s glued to your face for all sorts of typing, tweeting, and virtual candy crushing also has other purposes! It contains a magical portal to another world—a world where words are spelled correctly and definitions are listed alongside them in order to further expand your knowledge. This magical place is referred to as a dictionary. A mysterious book of yore, its powers are now accessible online. With great power comes great responsibility. You have the knowledge of the world at your fingertips, so use it, and use it well! Good grammar is vital when writing any kind of content—whether for social media, your blog, or even for a bathroom sign. Step away from the cyber farming and consult the dictionary. It could save you from having to dress up in order to dress down.